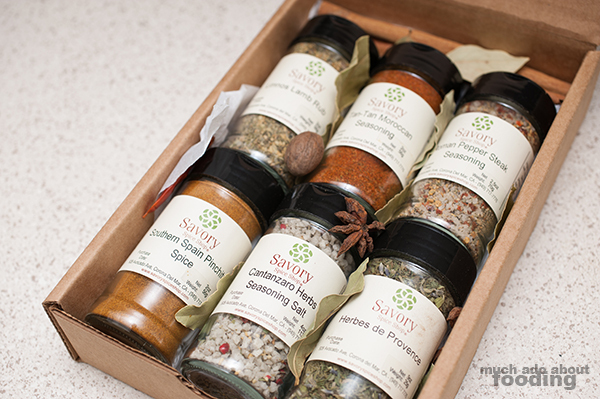 [Giveaway details at the bottom - winner will be announced 4/22/13] I've been a general fan of Savory Spice Shop since I first spied its smaller location set up inside the OC Mart Mix at the SoCo Collection in Costa Mesa. It seemed like a cook's dream come true - more than 400 herbs and spices for the picking and 160+ unique, seasoning blends. 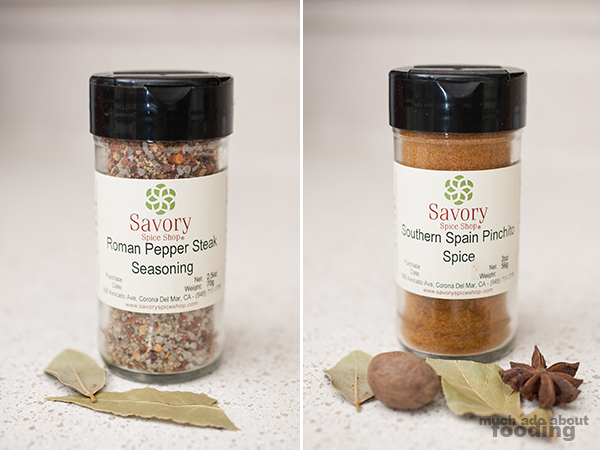 The special opportunity arose for me to get to know Savory Spice Shop better through their Corona del Mar location, both OC locations of which are owned by Randy Morton and Laura Shute. The original Savory Spice Shop is actually in Denver where all of the main grinding and hand blending occurs. Daily hand bottling is done at each of the franchise locations which are spread throughout the country. With each shop possessing limited storage of the spices and bottling daily, freshness of the spices is ensured. There aren't additives or preservatives in the spices either. I first spoke with Susan Carter, the store manager of both locations who had so much to share with me not only about the shops but also history, cooking, trends, and more. Correspondence with Laura then gave me insight about how the locations in Orange County started. If you're a lover of Savory Spice Shop, you should know that other long-time customers like yourself are the reasons why we even have OC locations! There wasn't an initial intent to franchise the business but with the constant egging by loyal enthusiasts, Savory Spice Shop warmed up to the idea. Once that became open, Laura jumped right into it with Randy after having already fallen in love with the store while visiting Denver. How long have the CDM and Costa Mesa stores been around? Has one seen more success than the other? Corona del Mar has been open two years and four months, Costa Mesa one year and four months. The Corona del Mar location is a larger, full-sized shop. Costa Mesa is about 1/3 of the size of Corona del Mar's and considered a "Stop" where we have fewer of our products. We manage all our inventory out of CdM so not only can we bring over something from CdM within 24 hours, we also move through our spice very quickly by sharing inventory and bottling all our spices on premises. Do the other nationwide shops look like the OC ones or is the set-up unique to the owners? The shops all have a similar feel and product line but have individual style representative of the owners. What are your backgrounds in the culinary arts? [Laura] Personally, I'm just a lover of food and the difference spice has made in my cooking. All of us at Savory Spice Shop have not been formally trained in culinary arts but are passionate lovers of food and constantly learning, cooking, and experimenting. Any one of us can tell you all you need know about our spices. Whenever I walk into one of the shops myself, I love the personal attention and tips given to me and every customer. It's part of the Savory Spice Shop charm. They call it a "shop" because it's not an in-and-out store but rather somewhere to go to build a relationship with a "neighbor" and learn. For the staff there who go through an extensive training program lasting up to six months sometimes (where they learn how to cook with the spices, talk about flavor profiles such as heat ratings, and study the history of the spices), answering questions and educating customers is key. They also make sure that everyone finds and gets exactly what and what amount they need instead of pushing pre-packaged products on them. It's a philosophy of "taste what you want, buy what you need" that they emphasize. What would you say are your most sold items? Truffle salt, peppercorns, our Capitol Hill Seasoning, Team Sweet Mama's BBQ Chicken Rub, Black Dust Coffee Rub and Peruvian Chili Lime Seasoning are some of our top sellers. Cubeb berries, kala jeera, and lovage are just some of the harder to find items we have. The markets carry so few herbs & spices now. Most overlooked but greatly valued? [Susan] Turmeric - it's inexpensive and robust with anti-inflammatory agents. What is your favorite item in the shop? What is one spice that should be in every kitchen? [Laura] Urfa Chile Pepper is the favorite. 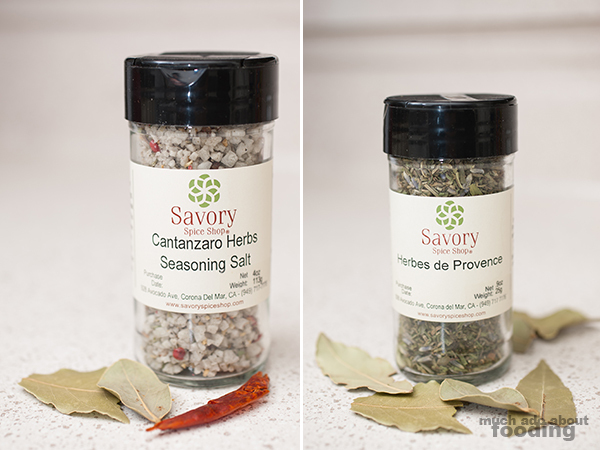 Every kitchen should have an assortment of salts and smoked peppercorns! [Susan] My favorites are Black Onyx Cocoa Powder, Turmeric, Freeze-Dried Shallots, and Star Anise (hard to pick just one!). Every kitchen should have good sea salt - one with which to cook, and another for finishing. One of the topics that Susan and I touched on was food trends. Pictured above you see a Himalayan salt brick, one of the more "trendy" items they have stocked due to popular demand (an example would be their Santa Maria Rub blend). Not only is this a beautiful presentation and conversation piece, it has a very unique use as a cooking stone both at very hot and cold temperatures. Perhaps you've seen this used in restaurants lately or on cooking shows. How curious it is that waves of popularity happen even if some ingredients themselves are not necessarily newly discovered; in fact, an example of something that has been around for years but has only now been used more prevalently is vadouvan curry! Interestingly enough, Susan also spoke to me about how sometimes politics get in the way of what's popular and what's not. History has shown saffron embargoes, cinnamon wars, and much more. Did you know that our idea of what cinnamon is was different years ago? We now think of Indonesian cinnamon's flavor profile when the original cinnamon used in the U.S. was Saigon cinnamon until the Vietnam war. I wonder what the next trend will be. Luckily for those hopping aboard the gluten-free trend train, Savory Spice Shop's products are gluten-free. What are your shops' visions for the customers that come in? That they become inspired - whether they are seasoned cooks or newbies we hope to bring our passion, excitement and impart fun into the process. If you could give one tip to someone starting out cooking, what would that be? [Laura] Season your food. People sprinkle seasonings on like it's salt and pepper; seasonings generally need a heavy hand. Don't be intimidated by cooking - it's not hard! Use your nose!!! 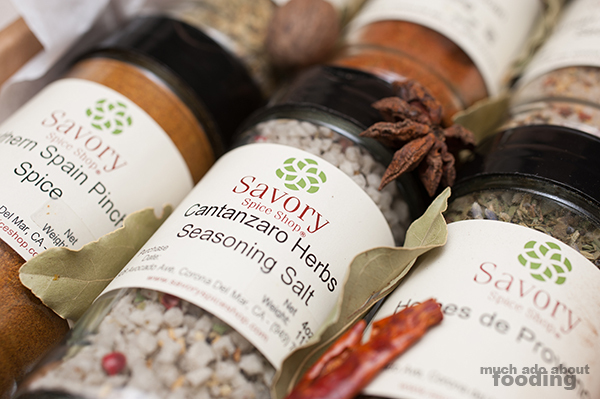 [Susan] Always taste your spices beforehand so you're aware of the flavor profiles you want to build in each dish. Take a "spice inventory" when you do your annual spring cleaning to maintain a flavorful spice cabinet year round. Cook with a friend whenever possible - it's fun and inspiring! I think one of the best things that I got from all the hours I spent talking with both Laura and Susan was the inspiring observation that Susan made: "When I look at the spices, I see a map of the world." She wasn't just referring to how their spices really are sourced from all over the world but the history and culture behind each, and honestly, that is why I got into cooking. I've always been so very curious about what builds a culture when it comes to cuisine. If that curiosity bug has bitten you as well, I highly encourage you to walk into a Savory Spice Shop one day and ask questions about what you're going to buy. Alternatively, you can also jump in and register for one (or more!) of their classes. These are based on flavor profiles of the spices themselves rather than just the other ingredients used in the recipes covered; you'll be a spice master in no time. I want to thank both Laura and Susan for taking the time to speak with me and Jane for making the introduction. 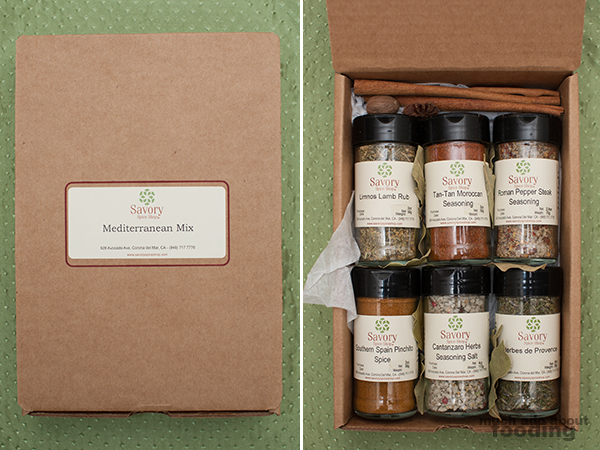 Savory Spice Shop has generously donated a Mediterranean Mix spice set (Southern Spain Pinchito Spice, Cantanzaro Herbs Seasoning Salt, Herbes de Provence, Limnos Lamb Rub, Tan-Tan Moroccan Seasoning, and Roman Pepper Steak Seasoning) for me to give away to an Orange County resident*. Look below for details and encourage others to enter as well. It's a beautiful set as you can see by the amount of pictures we took of it! Savory Spice Shop Corona del Mar is located at 928 Avocado Ave. Corona del Mar, California 92660, and Savory Spice Stop in Costa Mesa is located at 3313 Hyland Ave. Costa Mesa, California 92626. *NOTE: Winner must be an Orange County resident and will be contacted within 48 hours of giveaway's end. If he/she does not provide appropriate information 48 hours from contact, a runner-up winner will be chosen. I want to make a type of Arroz con Pollo using the Tan Tan Moroccan Spice and Preserved lemons that I made. Not sure what I'd cook, but I'm sure I would be Googling to find something! Thanks for the giveaway! Google is a recipe-finder's best friend sometimes. Hope you'd be using the "Recipes" search option then! Ooh, I haven't had lamb in a long time; sounds like it will be my first dish with this set. Lamb sounds like a perfect fit if you get the set! I'm going to make Indian-spiced butter chicken. Savory Spice Shop is the only place I've ever found aji amarillo. I've made a vegetarian aji de gallina with it. Very nice. Great to have met you last night Joe! I'd try to make the best salmon ever. 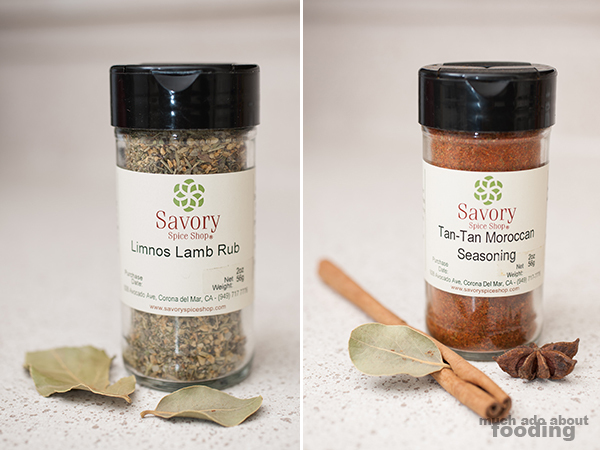 OMG Moroccan spice blend! WANT. I would make a (sad) attempt at replicating one of the dishes I had at Tagine.